Two suspicious packages were sent to former Vice President Joe Biden, adding to a rising number of attempted pipe bomb attacks on top Democrats and other public figures. The packages to Biden were intercepted at separate mailing facilities in Delaware. All of the suspicious packages were sent to people who have been verbally attacked by President Donald Trump and been vocally critical of him as well. On Wednesday, officials revealed that bombs had been sent or addressed to former President Barack Obama, former Secretary of State Hillary Clinton, former CIA Director John Brennan, former Attorney General Eric Holder, and Democratic Rep. Maxine Waters. The package addressed to Brennan was sent to CNN’s offices in New York City, despite the fact the former CIA director is actually an NBC News analyst. The package intended for Holder had an incorrect address and was returned to the sender, who was listed as Democratic Rep. Debbie Wasserman Schultz. On Thursday, officials said a suspicious package was also sent to actor Robert De Niro in the Manhattan building where his production company is based. All of the suspicious packages were sent to people who have been verbally attacked by President Donald Trump and been vocally critical of him. 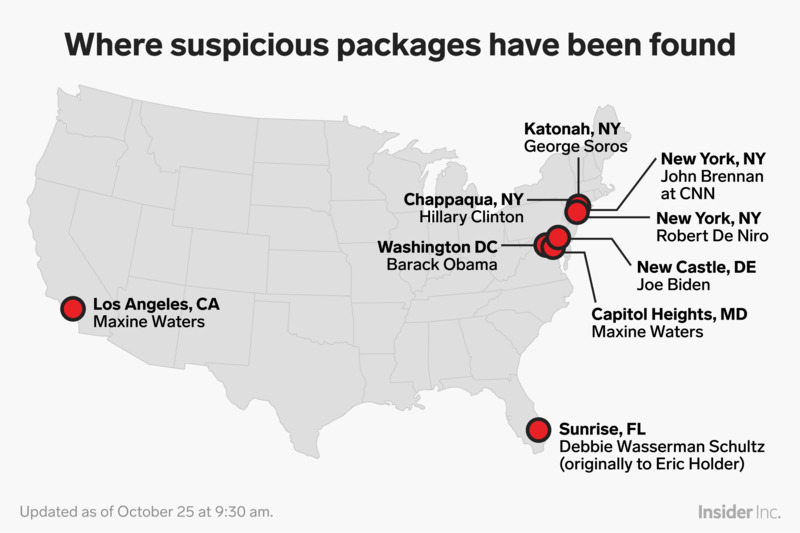 Wednesday’s incidents came two days after a bomb was found in the mailbox of billionaire George Soros, one of the biggest Democratic donors who has become a top target of right-wing conspiracy theories.